Last Monday just so happened to be the two-year mark since I met ABF on our first date. We met after work--ABF even trekked out to our not-so-convenient studio to see where we make the magic happen. 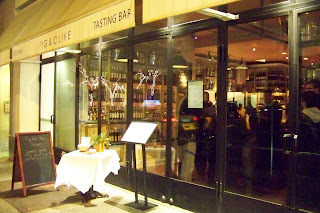 ;) Then we headed over to our Midtown east destination: Fig & Olive. 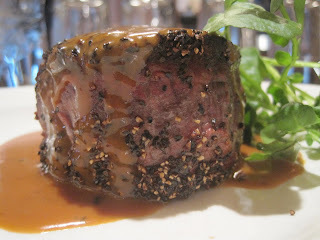 This was also Restaurant Week, which means you can order from a pared-down menu for a flat rate of 35 dollars each. 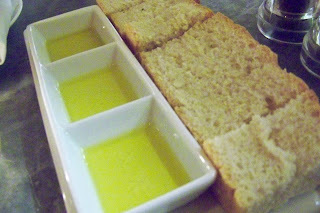 We were both verrrry hungry when we sat down for our 7pm reservation, so I was glad to see a trio of olive oils with some rosemary bread. The oils were from (top to bottom in photo) Spain, France, and Tunisia. 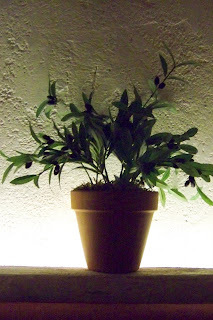 The Spanish one was my favorite, very grassy, green, and fresh. The French one was my least favorite--it had a very bitter tinge to it. It wasn't terrible, just not something I felt compelled to finish. I often find myself stuck on 2 choices when perusing a menu, and I will not hesitate to ask the server what s/he recommends. They have usually eaten a meal or two, or heard a complaint or rave or two, so I trust their opinion. I asked our server if he'd pick the fish stew or the tomato-red pepper soup, and he said 'pepper soup' before I'd even finished my last syllable. That was enough for me! I ordered it, and it was super duper. 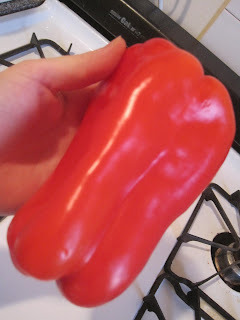 It was creamy without having any dairy in it, and its texture was almost completely smooth, with just a slight pulpy texture from the peppers. 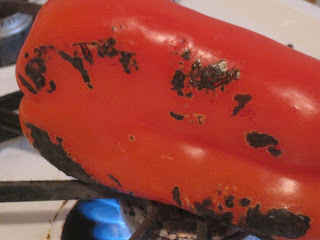 The flavors were balanced right between the two, with bites having both strong tomato and red pepper influences. The portion was pretty darn generous, too, so I shared a lot with ABF. His appetizer was even tastier than mine, but there was a lot more of mine to go around. 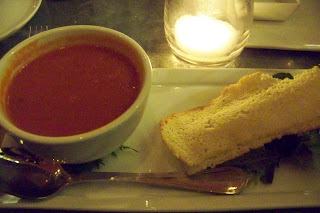 ;) The bread crisps on the side were just okay--they were pretty bland, but we used them to soak up the sauce from ABF's app, so they served a good purpose! 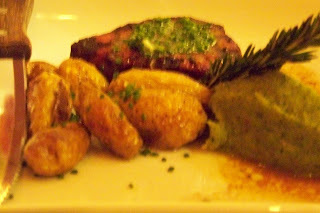 Kevin ordered the filet mignon entrée, which came with a parsley sauce, fingerling potatoes, and some sort of purée on the side. 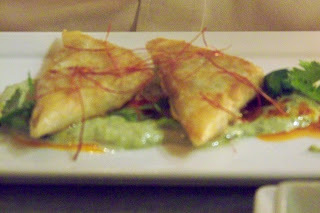 I had a bite of the steak, and it was cooked right and tasted very good, but it wasn't anything compared to those chicken samosas! I think we both agreed that this was just good, not great. 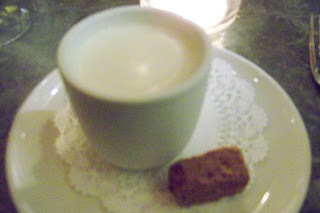 There were only two choices: a chocolate pot du creme and the "dessert crostini." I, of course, chose the chocolate, as ABF is not so huge a fan and I definitely am. 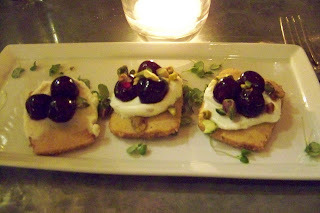 I saw his crostini had Amarena cherries, though, which I love, so I knew I'd enjoy his, too. Ah, sharing. Isn't it sweet? But back to my dessert. Holy RICHNESS. This thing was awesome. 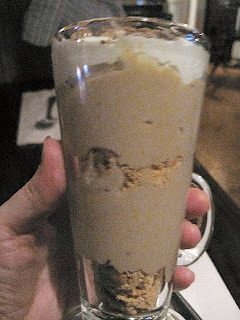 It as better than the best chocolate pudding/custard/creme brulee you've ever had. 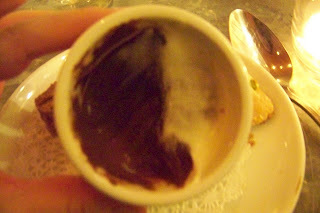 It had a thin layer of real cream on top, and the chocolate was smooth, dense, dark, and absolutely divine. I couldn't scrape enough of it out. Even ABF had not one, but two bites! If he goes back for a second bite of anything chocolate, it is noteworthy. Oh man this was so so so so good. But these cherry-topped beauties below are what will bring me back to Fig & Olive. Heavens to mergatroid! They are sandy, not-too-crumbly shortbreads with mascarpone cheese, amarena cherries, and chopped pistachios. And they. are. AWESOME. ABF was more than generous in giving me one all for myself! I ate half first, then ate my dessert, then finished up with the cookie. Worth every single delicious crumb. Wow. It's just BARELY sweet, and it's tangy and zingy and bursting with cherry and creaminess and wow. Sooooooooooo good. I highly recommend this place for their apps and desserts. 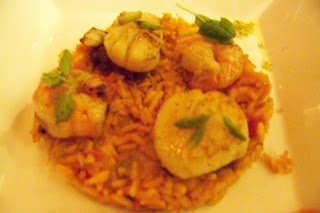 I would probably sit at the bar next time and stick to the small plates--the entrées weren't amazing. The smaller plates absolutely were, though! How easy is this recipe? 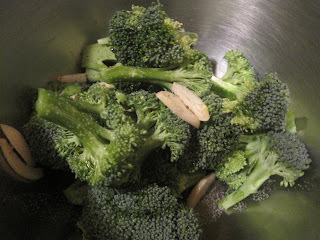 Take a bunch of broccoli, chop it up, and toss it in olive oil, salt, pepper, and slices of raw garlic. Spread it all out in one layer on a baking sheet and roast for 20 minutes at 450 degrees. I might have taken it out just a tad early to avoid burning it, but it was fan-freaking-tastic! 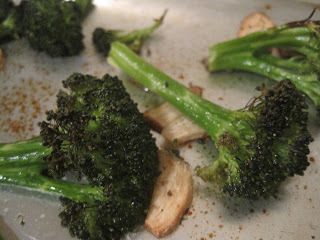 The broccoli florets have a slight crunchy chewiness to them which reminded me a lot of the crispy kale. 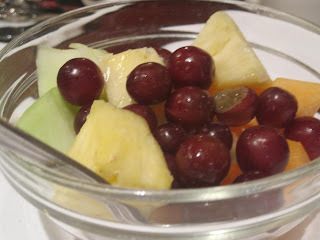 It was super yummy and, dare I say, super healthy! Sure, you could pay six dollars and up for a jar of roasted, peeled red peppers, or you could make your own for one-sixth of the price! 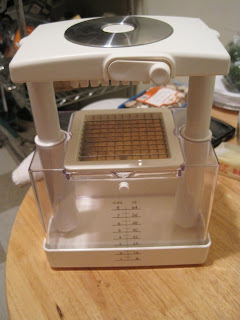 Sara & I attended a Williams-Sonoma cooking class weeks ago at Columbus Circle. Sara had won the class and kindly invited me to join her. We showed up early on a Saturday morning, ready to learn and taste! 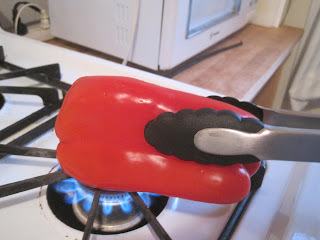 One of the chefs running the demonstration roasted a pepper while we talked, and it was so easy that I decided to try it myself. 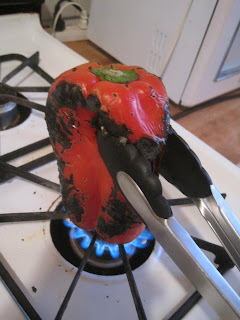 Easy is right--you take the pepper and place it right over the gas flame! 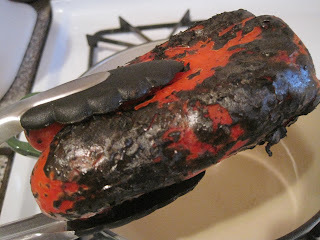 Unfortunately, my burners weren't as tall as the ones at the store, so my blackening wasn't as even, but I could tell by the smell it was getting the job done. A few alarming pops and cracks happen, and you definitely have to keep a constant eye on this, but it was so simple I can't believe I waited this long to do it! It took about six minutes to get the look I wanted. 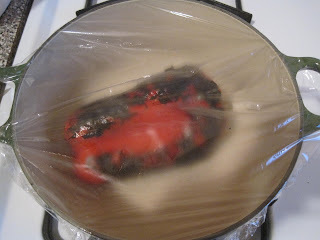 Once I had sufficiently charred it (you can really smell the aroma of the roasted pepper at this point), I put it in a bowl and sealed the top with plastic wrap. This is supposed to seal in the moisture and make the skins even easier to remove. 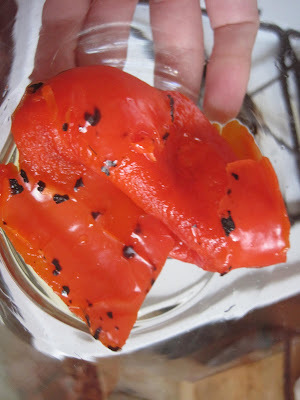 After 30 minutes of letting the pepper sit, I ran it under some cold water and presto--peeled, charred peppers! I removed the seeds but saved the juice from the pepper and added that to the jar I used to store it. 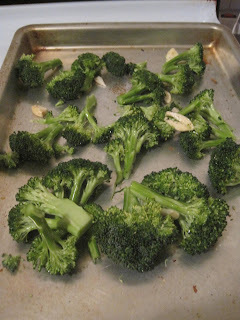 Some reviews I read online said this is not a 'true' roasted pepper, and that you have to toss it in the oven for a bit like I did with the broccoli, so I did half and half. Both versions came out delicious. So fun and so good for you! Okay, I admit it. I'm a salsa snob. I make my own, working off a recipe my mother learned from a friend of ours from Mexico. Yes, it's a state secret, and yes, I'm pretty sure my mom would cut me if I gave it to you. 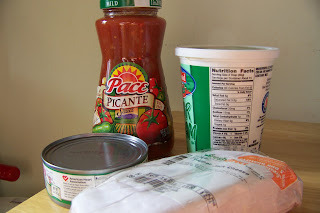 So when Foodbuzz.com sent me 2 complimentary jars of the 'new and improved' Pace Picante Sauce (part of the Tastemaker program I signed up for), this salsa snob scoffed. I rolled my eyes. And I let the jars sit on my pantry shelf for a good long while. 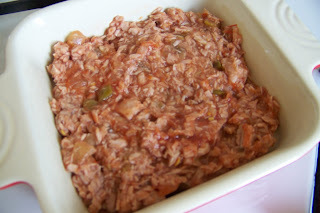 One night, making my weekly batch of tuna fish for lunch, I glance up and saw the jar of Pace. Hmmm...how would tuna mixed with Pace taste? I decided to give it a try, but I wasn't ready to commit to blog about it unless I really, really liked it. I know there are critics who relish eviscerating a dish, but I'd much rather extol the virtues of a perfectly-executed plate than waste time and calories on some not-so-good grub. Here's all you need: a jar of Pace Picante Sauce (I used the mild in this case), a little bit of sour cream, a can of tuna and some Pepper Jack cheese. PJ Cheese makes EVERYTHING better. I figured even if this turned out awful, I wasn't out that much money (the sour cream was already in my fridge, the Pepper Jack cheese and the tuna fish were on sale at FreshDirect.com, and the salsa was FREE!). I mixed the tuna and the salsa together. It smelled pretty decent, even if it didn't look so pretty. I took a bite, and was pleasantly surprised at how delicious it was. It could only get better from here! Next step, a thin but smooth layer of sour cream. You could certainly use plain Greek yogurt here if you want. I popped this under the broiler for 3 minutes, just to warm it through and get it ready for the cheesy, delicious topping. I sprinkled a scant cup of shredded Pepper Jack and popped it back under the heat for another 3 minutes, standing guard because I know how quickly it can go from broiled to burned! I opened the door as soon as the timer went off and let out a low, victorious chuckle...oh, this was gonna be good. 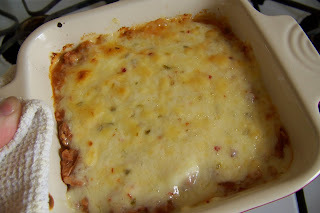 Ooey, gooey, cheesy, salsa-y goodness. I doled out a healthy helping on top of some crumbled tortilla chips and went to town. 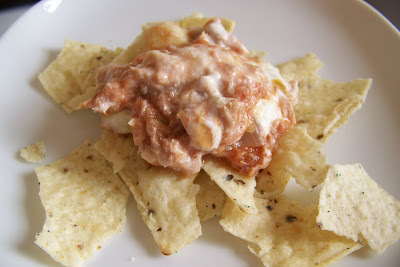 This might be my new favorite snack dip! 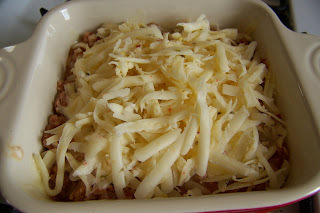 It's ready in under 10 minutes, it cost me less than five dollars, and it is delicious! The tuna isn't fishy, and it gives the dip some heft. The pepper jack gives it some heat (I wish I'd remembered the Medium-Spicy jar of Pace was already in my fridge before I made this! 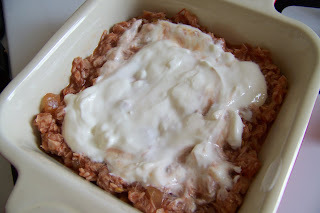 ), and the sour cream cools it all down again. And to my surprise, the veggies really ARE still crunchy! So help me, I swear they were STILL. CRUNCHY. I'm actually impressed. That's all for now from this salsa snob: stripped of her skepticism (and in the most delicious way). Thanks again to the awesome people at Foodbuzz.com and from Pace Picante Sauce for the free food and the chance to share it with my visitors! 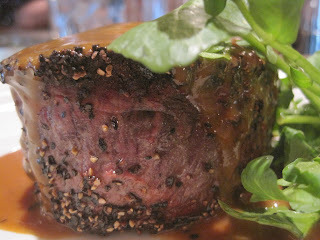 My friend Carlota is working at Angelo & Maxie's --it's a classy steakhouse conveniently located near Union Square. I didn't let the 'classy' thing stop me, though, and dropped in one Saturday with my friend Sara. Carlota had been telling me for some time about their 3-course prix fixe deal, and I decided now was the time to go for it. For 20.99, you get a salad (or French Onion Soup for 1.50 extra), entrée and dessert. 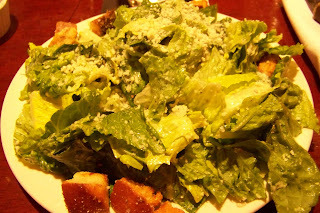 Sara & I both got the Caesar, though I opted for mine with anchovies on the side. Here's the thing--I know they offer incredible depth of flavor and tang to recipes, but I need to NOT KNOW they are there. 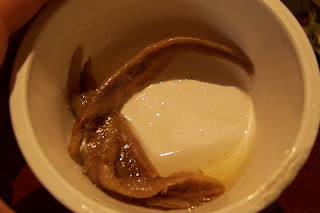 If you make me dressing with anchovies in it (not too many, now, there is such a thing as too fishy), I will eat it and enjoy it. But if you give me the option of NOT putting them in there, then yeah, I will wimp out and ask for them on the side. And then see their hairy fishiness and not use them at all. Sometimes I'm lame like that. The salad, however, was delicious and HUMUNGOUS. steak there, taking my sweet time with each wonderful bite, and wrapped the other half to take home. We each got a glass of Malbec. Carlota recommended it highly, so of course we took her at her word. Sara & I have had similar experiences with Malbecs: we've had some great ones, we've had some AWFUL ones. 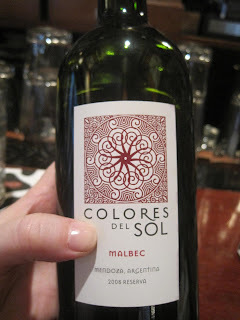 This one, the Colores del Sol, was fantastic. It was light, puckery, and perfect with the steak. 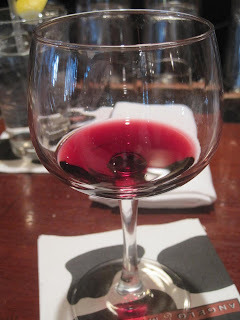 Later that night when I went home, I was flipping through old foodie mags (trying to get rid of clutter), and I spotted the same wine being touted as a winning pick for reds. I couldn't agree more! Then the time came for dessert. Oh, the cheesecake. 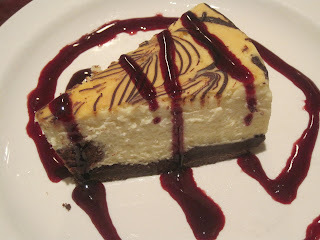 The dense, tangy, New York style cheesecake, with a drizzle of intensely flavorful raspberry sauce. I am so glad I ordered this. It was rich, it was satisfying, it was exactly how I like my cheesecake. I shared a few bites with Sara, who was being good and getting the fruit, then I packed the rest up for the next day (and I promise you, I finished it the next day). This deal is beyond excellent. The portions are fantastic, the food is delicious, and the staff (aka Carlota) is superb. 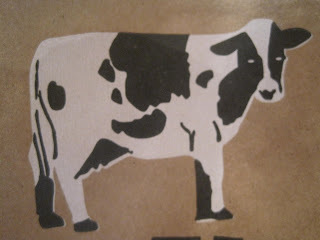 You might even have enough to take home for later (the cheeky little cow below is from my take-home bag)! If you're in there for this deal, make sure to belly up to the bar and take care of your bartender--cuz she'll take care of you! Thanks again, Carlota, for taking such good care of US! 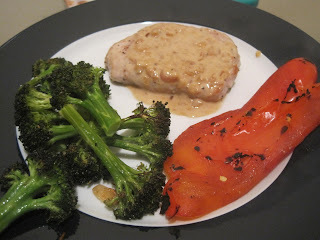 One of my all-time favorite dishes is Chicken Tarragon. My mom made this a lot as I was growing up, and whenever my birthday would roll around, this is what I'd ALWAYS request. 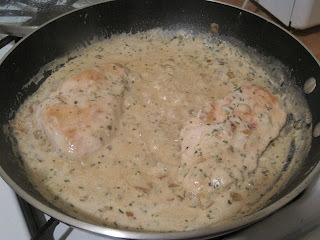 It's basically chicken breasts in a sauce with white wine, shallots, and cream. YUM. My mom would crack open her thick, blue New York Times cookbook and soon the kitchen would be warm and welcoming with that trademark aroma of my favorite dish. I love this cookbook so much that I tracked down copies on Ebay for both my sister and me years ago. As soon as my copy arrived, I scrambled to the index and looked up the recipe for Tarragon Chicken (as they call it--it's on page 189 if you're reading along at home). I made it on my own, didn't even call my mom for help (it was an "I'm a big girl now" moment), and when I took the first bite and realized it was (almost) as good as my mom's, I was exceedingly proud of myself. 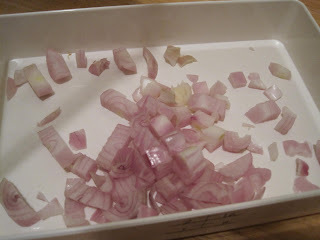 This dish is all about the shallots and the tarragon, IMO. 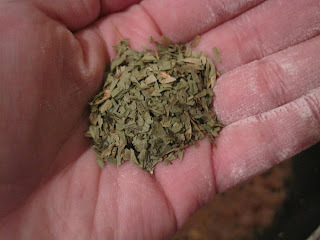 I feel like tarragon gets neglected in favor of basil, oregano, etc, but I highly encourage you to try it. It's a very subtle, earthy flavor that is hard to describe...yet highly recommended. 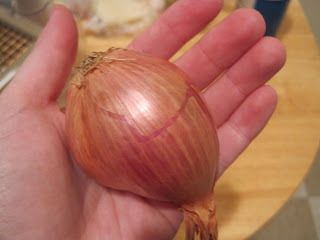 As for shallots, don't get me started on how awesome these babies are. I picked out a beauty and put it through my awesome chopper. Sometimes a gal feels like dicing on her own, and sometimes she feels like giving the chopper a cathartic whack and doing it in one fell swoop. 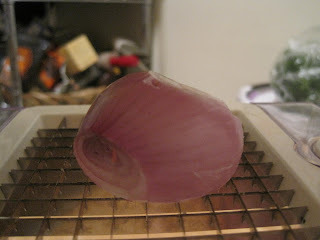 I made this for ABF on Valentine's Day, but it didn't come out quite right, as my pantry was not completely stocked. When my friend Kwame came over the other week, I was ready to go. I made this for us, told him the history of this dish, and he summed it up quite perfectly. He said "I can see why this is a favorite.. it tastes like home." I paused and said "You are exactly right!" To me it definitely tastes like home. I vividly remember my mom always put the dish, and the abundance of sauce (this dish is all about the sauce) in a big white ceramic tureen-type dish, keeping the lid on until the last moment to keep it piping hot. That's the next step, I suppose: I gotta get one of those dishes! Season the breasts with salt and pepper, dredge in flour (save leftover flour for later in dish). In large, hot skillet, add 3 tablespoons of butter and brown the chicken on both sides. Transfer to another plate, keep warm. 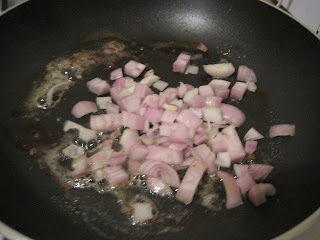 Add shallots to skillet and sauté briefly, add wine. Cook mixture over high heat until nearly evaporated, scraping up brown bits stuck to pan. 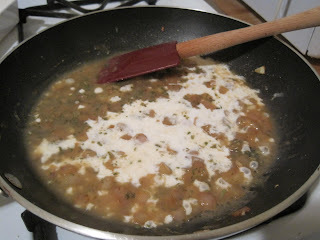 Add remaining flour and stir to make thick paste. Sprinkle in tarragon, add chicken broth. Return chicken to skillet, cover and cook until tender (about 25 minutes on low heat). Transfer chicken to heated platter, keep warm. Add rest of butter and cream to skillet, stir. 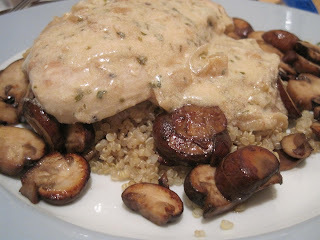 Pour sauce over chicken (I made quinoa and mushrooms to go with it) and ENJOY! It was pretty empty when we walked in--it was the tail end of Thanksgiving weekend and most people had cleared out already--so we had our pick of tables. 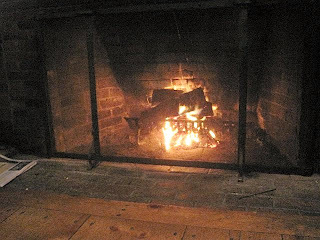 We grabbed one right by the roaring fireplace--delightful! It smelled and sounded awesome...smoky and crackling and just the thing for a cold (and I mean COLD) winter's night. We had tried the chowder.. 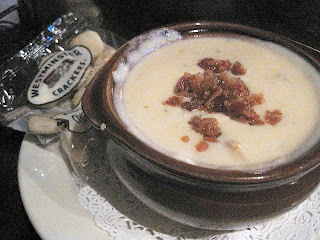 I mean CHOWDAH..here last year, and we both jumped on the chance to have it again. There was no sharing this time--we each got our own. The bacon on top was crunchy and crispy, but honestly, I would have been happy without it, too. Just a crank or 2 of fresh-cracked black pepper is all this dish needs. So good! 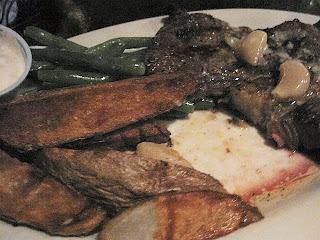 Kevin ordered the steak frites, and this smelled scrumptious. 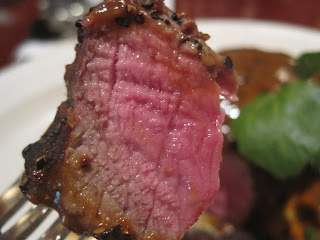 He let me try a bite, and it was fantastic--lightly seasoned, just some salt, pepper, and perfectly-cooked meat. The frites weren't bad, either. I can't explain what made me pick the chicken sandwich--probably the promise of melted pepper jack cheese and a chipotle sauce. I had NO idea this sandwich would be so outstanding. I gave ABF a bite, and he was impressed, too. 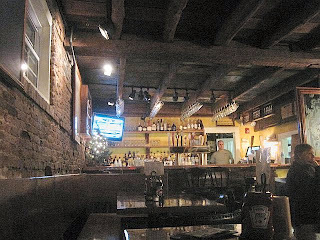 This place takes what could be bland, basic pub fare, and makes it memorable. 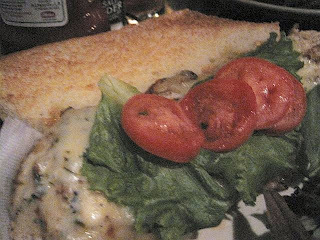 This chicken sandwich was DELICIOUS...it could have been a boring, unseasoned grilled chicken breast, but instead it was a savory, lip-smacking, peppery-cheesy bit of pub food perfection. We were on the border of happily fed and almost stuffed, but we decided to split a dessert. I can't remember what we first picked, but I know I was looking forward to it, only to find out they'd run out (this is what happens when I don't take enough notes AND wait 2 months to post!) 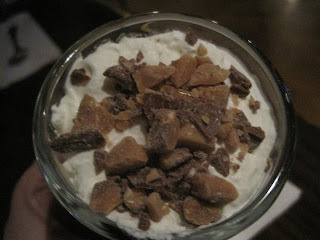 We settled on a butterscotch (sorry, I said toffee earlier) parfait that came topped with crumbled toffee pieces (yum) and layered with crumbled graham crackers--this would have been better if the graham crackers had been the kind coated in cinnamon-sugar. The flat, unseasoned graham crackers were a little bit stale...not so much a win. The butterscotch flavor was good but not great. Not terrible, but definitely not worth the splurge. 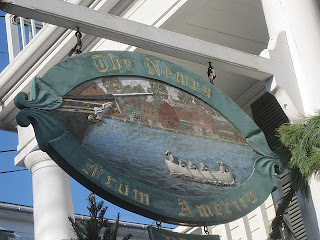 Dessert dissatisfaction aside, you can't beat the Newes for its atmosphere, its location, and overall, its food! We had come here the night before for a drink and chatted with the bartender, who was also our server this night. He chatted with us at length the night before, and recognized us that evening, too and made us feel quite welcome. 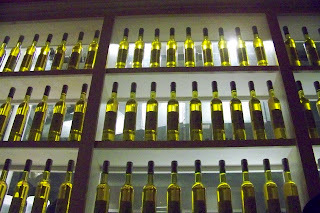 I can definitely see why this has always been on ABF's 'must-visit' list...and I hope we visit them again soon!